What was the PESIT trial? The PESIT trial was a cross-sectional study of patients older than 18 years of age who were hospitalized for a first episode of syncope. This was a multicenter trial, taking place in 11 hospitals (2 academic, 9 nonacademic) in Italy. There were several important exclusion criteria to this study including patients on anticoagulation, pregnant patients, and those with previous syncopal episodes. Most importantly, however, the study excluded all patients discharged and solely focused on those admitted for an inpatient evaluation (Figure 1). All included patients were subjected to a standardized history aimed at suggesting the cause of syncope and identifying risk factors for pulmonary embolism (Figure 2). They then underwent mandatory chest radiography, electrocardiography, arterial blood gas testing, and routine blood testing, including a D-dimer assay. Further diagnostic workup for causes other than pulmonary embolism was not standardized and varied between patients based on attending physician discretion. The presence or absence of PE was assessed with a validated algorithm based on pretest clinical probability and the result of the D-dimer assay. 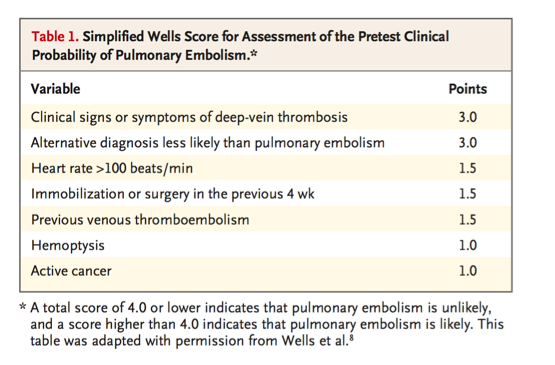 The pretest clinical probability was defined according to the simplified Wells score, which classifies PE as being “likely” or “unlikely” (Table 1). 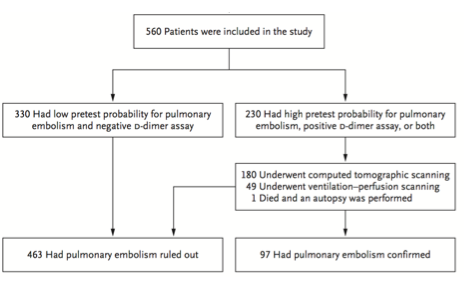 In patients who had a high pretest clinical probability, a positive D-dimer assay, or both, computed tomographic pulmonary angiography or ventilation-perfusion lung scanning was performed. The primary outcome of the PESIT trial was to measure the prevalence of pulmonary embolism in patients admitted to the hospital for syncope. Secondarily, the thrombotic burden was assessed by measuring the most proximal location of embolus or the percentage of perfusion defect area. In 58.9% (339/560) of patients, PE was ruled out by low pre-test probability and a negative D-dimer. 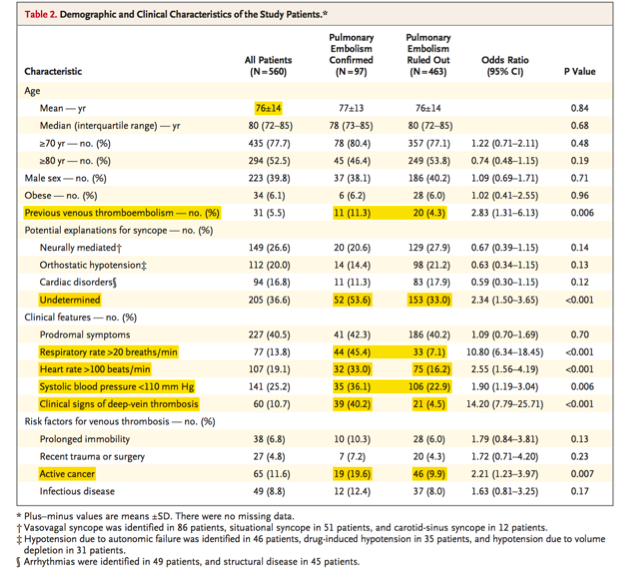 Of the remaining patients, 42.2% (97/229) had a pulmonary embolism. In the entire cohort, the prevalence of PE was 17.3% (97/560). Thus, the authors concluded that nearly one of every six patients hospitalized for a first episode of syncope has a pulmonary embolism (Figure 3, Table 2). 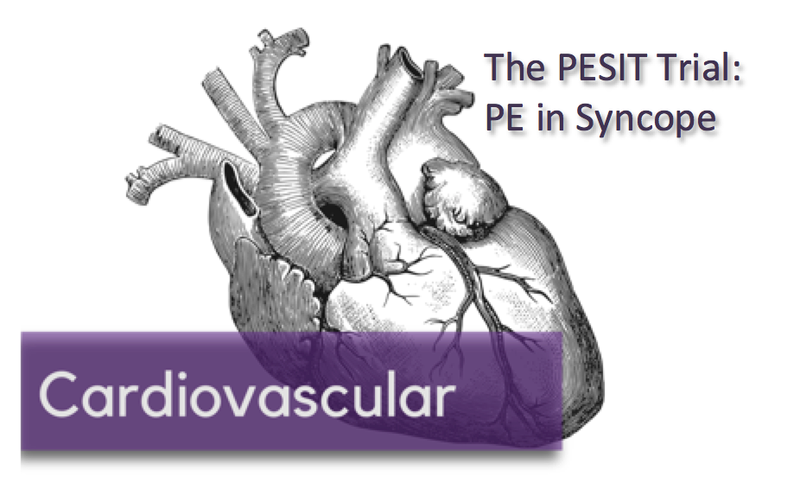 The major strength of the PESIT trial is the systematic approach with which PE's were diagnosed. ALL admitted patients underwent consideration of and testing for PE based on risk factors and pretest probability. Even if, for example, the initial ECG suggested an arrhythmia as the cause of syncope, if they did not rule out for PE, they went on to get a scan. This ensured a complete and thorough investigation. Furthermore, their results were internally valid, as the prevalence of PE was consistently 15-20% across all 11 centers. Additionally, the population studied is also fairly representative of those who most emergency medicine physicians would admit to the hospital with syncope. Reasons for admission included trauma, severe comorbidities, failure to identify a cause in the ED, and a high probability of cardiac syncope. While we don’t commonly site the EGSYS score that they used, the components such as palpitations, heart disease, and an exertional component to syncope, are all considerations that factor into our clinical gestalt for admission. A glaring problem with this study is the significant variation in diagnostic workup beyond PE. Other potential explanations for syncope were much more likely to be undetermined in those with confirmed embolism (see table 2). Because further workup was left to the discretion of individual physicians, alternative and perhaps more causative causes of syncope may have been under-diagnosed or underreported. Furthermore, this study has limited external validity when used to assess our ED population as a whole, given the exclusion criteria of all patients discharged from the ED. When recalculating the prevalence based on all patients who presented to the ED, only 1 in 26 (97/2584 = 3.8%) patients were diagnosed with a PE, far fewer than their conclusive 1 in 6. A major contributing factor is likely age. As expected, the mean age of patients discharged was much younger at 54 years (range 16 to 79). These patients are much less likely to develop PE based on currently available decision rules such as the PERC Rule. We commonly use tools such as the PERC Rule or the Wells score to quantify our pretest probability because they include characteristics known to be associated with PE. As seen in the clinical characteristics described in table 2, patients diagnosed with pulmonary embolism had a high prevalence of symptoms commonly associated with PE, such as hypoxemia and tachycardia, or clinical manifestations of DVT. They were also far more likely to have a history of previous venous thromboembolism or to have active cancer. A large proportion of PESIT patients diagnosed with PE presented exactly as we would expect patients with a PE to present. These data strengthen support for current clinical practice, which for most physicians means only entering the diagnostic pathway for pulmonary embolism when history and physical exam suggests it as a potential diagnosis. In summary, Pulmonary embolism is an important “must-not miss” cause of syncope, but it is likely an uncommon diagnosis in patients who pass out, recover, and appear well – the main way that most patients in the US with syncope present. Overall, 1 in 26 patients who present to the ED with first time syncope may have a PE. A large portion of these may be clinically insignificant and not causative of syncope. Those with symptoms and signs of PE are more likely to have a significant PE and should be evaluated as such. Thus, we should not change our current clinical practice based on the results of the PESIT trial. The second key question for a consumer of medical literature to ask is, simplistically, “are these patients like mine?” The answer to this is probably no. The patients included are different than a typical US ED "undifferentiated passing out patient" not just because they are Italian, but also because they had a high prevalence of symptoms to suggest PE such as history of PE/DVT, or history of malignancy. In the US, we would probably not consider many of these patients to be “undifferentiated syncope.” Rather, we would consider them to be possible symptomatic PE patients and simply test them. Dr. Ireland points this out in his evaluation of table 2. It is not a novel finding that many of the patients with these comorbidities, signs, and symptoms went on to have PE when tested (Courtney Annals of EM Annals of Emergency Medicine 2010;55(4):307–315). Another way to examine generalizability is to examine the course of these syncope patients and ask if this is similar to the course that would be taken in the US. Of the 2584 ED syncope patients in this study, 1867 were discharged. Are we discharging 72% of our syncope patients? Whether or not we should be is another question. However, it is likely that the US ED environment has a much lower threshold for admission for syncope than the Italian setting, similar to the way that the US ED environment has a much lower threshold for testing for PE than the European setting. Therefore, it is highly likely that, at least to some extent, these Italian syncope patients are more ill than the average US ED syncope patient. This is supported by the elderly median age in the Prandoni study of 80….meaning half of all their patients were over 80 years of age! Also note that of the 717 remaining patients not discharged, a further 157 were excluded. So this sample really is a unique selected group…..making it difficult to generalize this study to the average US ED patient with syncope. Dr. Jeff Kline and I explored the possible external generalizability of this report in a re-examination of the PERC dataset which included 7940 patients from 12 US emergency departments, all of whom had symptoms prompting testing for PE. Among 466 PE positive patients, 6.6% reported syncope, while among 7474 PE negative patients 6.0% reported syncope (95% CI for difference, -1.7 - 3.0). This suggested syncope was not a predictor of PE. We also noted in the Prandoni study a mean age of 75 and a high prevalence of main pulmonary artery clot (42%), something we have not found in US studies of undifferentiated PE patients where median percent obstruction was 9%. In elderly syncope patients with some combination of tachycardia, tachypnea, hypotension, active cancer, and perhaps especially those without a clear suspected cause of syncope, PE should be a consideration that warrants testing. Perhaps this should be considered even when patients do not have the more traditional symptoms of PE such as dyspnea or chest pain. However, we would caution clinicians NOT to interpret this study as rationale for widespread testing on all or nearly all US ED syncope patients. The outcome of such a simplistic interpretation of this study would undoubtedly result in further radiation and contrast burden and harms for our patients. 1. Syncope Evaluation in the Emergency Department Study (SEEDS): A Multidisciplinary Approach to Syncope Management. Win K. Shen, Wyatt W. Decker, Peter A. Smars, Deepi G. Goyal, Ann E. Walker, David O. Hodge, Jane M. Trusty, Karen M. Brekke, Arshad Jahangir, Peter A. Brady, Thomas M. Munger, Bernard J. Gersh, Stephen C. Hammill and Robert L. Frye. Circulation. 2004;110:3636-3645. 2. AHA/ACCF Scientific Statement on the evaluation of syncope: from the American Heart Association Councils on Clinical Cardiology, Cardiovascular Nursing, Cardiovascular Disease in the Young, and Stroke, and the Quality of Care and Outcomes Research Interdisciplinary Working Group; and the American College of Cardiology Foundation: in collaboration with the Heart Rhythm Society: endorsed by the American Autonomic Society. Strickberger SA, et. Al. American Heart Association Councils on Clinical Cardiology, Cardiovascular Nursing, Cardiovascular Disease in the Young, and Stroke; Quality of Care and Outcomes Research Interdisciplinary Working Group. American College of Cardiology Foundation. ; Heart Rhythm Society. ; American Autonomic Society. Circulation. 2006 Jan 17;113(2):316-27. No abstract available. Erratum in: Circulation. 2006 Apr 11;113(14):e697. 3. Prospective validation of the San Francisco Syncope Rule to predict patients with serious outcomes. Quinn J, McDermott D, Stiell I, Kohn M, Wells G.. Ann Emerg Med. 2006 May;47(5):448-54. 4. Etiology of syncope in hospitalized patients. Saravi M, Ahmadi Ahangar A, Hojati MM, Valinejad E, Senaat A, Sohrabnejad R, Khosoosi Niaki MR. Caspian J Intern Med. 2015 Fall;6(4):233-7. 5. Prevalence of Pulmonary Embolism among Patients Hospitalized for Syncope. Prandoni P, Lensing AW, Prins MH, Ciammaichella M, Perlati M, Mumoli N, Bucherini E, Visonà A, Bova C, Imberti D, Campostrini S, Barbar S; PESIT Investigators. N Engl J Med. 2016 Oct 20;375(16):1524-1531. 6. Jiménez D, Aujesky D, Moores L, et al. Simplification of the pulmonary embolism severity index for prognostication in patients with acute symptomatic pulmonary embolism. Arch Intern Med 2010; 170:1383. 7. Jiménez D, Kopecna D, Tapson V, et al. Derivation and validation of multimarker prognostication for normotensive patients with acute symptomatic pulmonary embolism. Am J Respir Crit Care Med 2014; 189:718. Posted on September 26, 2017 by NUEM Blog and filed under Cardiovascular and tagged syncope PE Pulmonary Embolism PESIT.